While airbags offer an important safety feature and supplement to seat belts in cars, vans, trucks and sports utility vehicles, there are a number of ways that they can malfunction. Whether due to a design flaw, a mistake during manufacturing, installation or insufficient directions provided to consumers for safe and effective usage, when airbags fail to work properly, the results can be catastrophic. Therefore, if you believe that a defective airbag has caused your injury, Taylor Anderson is the products liability and personal injury attorney that you can trust to determine your rights and eligibility for compensation. With crash sensors, an electronic control unit (ECU) and airbag modules containing inflators and folded bags, airbags are complex systems. Thus, while many operate effectively, airbag safety cannot be assumed, as noted by Your Legal Guide. A few examples of airbag defects include an instance involving a low-speed crash in which the airbag deployed too forcefully, as well as an accident in which the airbag deployed too late. Root sources of these malfunctions might include outdated or inaccurate software, untethered airbags, overpowered inflators, poor airbag folding or improper placement of crash sensors. Airbag injuries are notably serious, and are mostly confined to the head, torso and arms. Severe chemical burns, loss of hearing and vision, broken bones, traumatic brain injury (TBI) and even decapitation are examples. 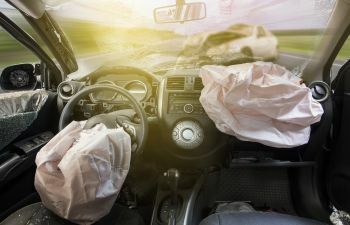 Though liability law pertaining to defective airbags remains stringent, victims must provide evidence that the airbag defect was “unreasonably dangerous”. Having an attorney on your side can make all the difference in your case. After all, the manufacturer’s insurance company might refuse to pay the full cost of medical expenses, lost wages or other damages. They may also drag out the process of settling a claim or deny it altogether. When you need someone to hold insurance companies and manufacturers accountable, attorney Taylor Anderson is well positioned to advocate on your behalf. Leaving no stone unturned, Taylor gathers all the facts pertaining to each case and builds a claim that will produce the most favorable outcome possible for injured victims. For a confidential review of your case, call the Taylor Anderson Law Firm in Charleston, West Ashley and James Island today.